An unnamed Australian company has agreed to pay a AU$160,000 piracy settlement to the Software Alliance. The manufacturing outfit reportedly used commercial software without a proper license. 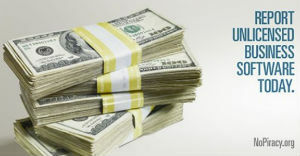 The copyright infringement was revealed following a tip from an informant who will receive a healthy AU$10,000 reward. Over the past two decades, the Software Alliance (BSA) has represented major software companies including Adobe, Apple, Microsoft and Oracle, in their fight against under-licensed businesses. This has resulted in audits at thousands of companies worldwide, whose computers are carefully inspected to see if the business owner has failed to pay his or her dues. Some of these audits have been controversial and the evidence collection process has raised eyebrows as well. Especially BSA’s explicit attempts to convince people to report companies in exchange for hard cash. In recent years, the industry group has actively solicited such tips from the public. Legitimate leads are then followed up with a thorough investigation or audit, something many companies are contractually obliged to agree to. If unlicensed software is found during an audit, BSA tries to negotiate a settlement. This is what happened with an unnamed Australian manufacturing company, CRN reports. It’s not clear what type of software was used improperly. What we do know is that the ‘tip’ came from an anonymous informant who presumably works or worked at the company in question. 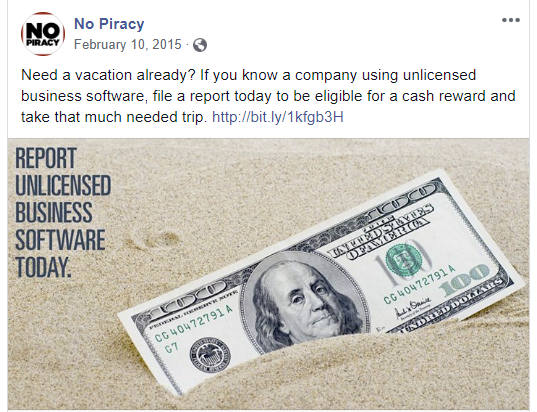 “We work in a competitive industry and while we’re all trying to get ahead, it didn’t feel right using infringing copies of software to give the business an unfair competitive advantage,” the informant reportedly told BSA. It’s unclear whether the informant also raised the issue internally, but that doesn’t matter anymore. The BSA followed up the lead which eventually led to a significant AU$160,000 settlement. The whistleblower, tipster, or rat, depending on which side you’re on, fared well too. BSA says that the information it receives from informants is invaluable. It plays a critical role in identifying misbehaving companies and holding them accountable, so it’s worth a reward. “BSA is grateful to the informant for doing the right thing, and have provided the informant with a reward of AU$10,000 for his assistance in this matter,” BSA told CRN. This is not the first reward BSA has given out, there have been many others in the past. The scale of the award usually depends on the settlement amount. It’s usually good enough for a nice vacation though, as this old BSA ad also suggests.